Heart disease will kill you if you don’t detect it and treat it in time. That is true— physically and spiritually.Wanting to look your best is commendable. It can enhance your sense of self-worth and improve your prospects in life. But it’s a big mistake to dwell on your appearance and neglect your character. Thank you very much for your kind help and inspiration. What you’ve sent me is very relevant and motivating. Many thanks once again! 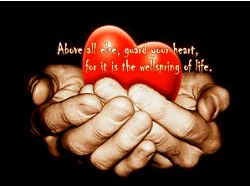 Fantastic insight into protecting our hearts. People don’t realse that what you think about comes about, and so whatever your deep thoughts are is what s going to show to the world. I am so grateful that I found the Healing Codes not long after they came into being. Healing from inside is a very difficult thing to do without some kind of help and the Healing Codes are very, very helpful. I would like to do a blog over the next few days on the subject discussed here today to enhance what has been said by Tim Hetzner, President of Lutheran Church Charities and so kindly shared by Mary Ann Costello. Thanks to all involved. And may God bless you to have a great day today.